(AINA) -- Thousands of unsolved political and religious murders have been allegedly committed by the terrorist network Ergenekon in Turkey. Among these are the murders of up to 50 Assyrians during a ten year period between 1987 and 1997 in the Turabdin area, in southeastern Turkey. Assyrians have begun to speak openly about it for the first time. In an interview with Cihan news agency, Gebro Tokgöz, an Assyrian living in Midyat has asked for an investigation into the unsolved murders of Assyrians. "Ergenekon-prosecutors should investigate all killings committed against the Assyrians in Turabdin." said Gebro Tokgöz. "At that time we often received anonymous threat letters and phone calls. Our villages had been attacked, the area's most famous doctor, Edward Tanriverdi, was murdered when he was on his way home. Even a pregnant woman and her husband were brutally murdered. But in case after case, the police closed the investigation, citing 'unknown perpetrators.'" But shortly after this interview was published, Gebro Tokgöz was interviewed by the local newspaper Midyat Habur, were he said that the Cihan news agency had misquoted him and that he did not intend to single out Ergenekon or anyone else for the murders committed against Assyrians in Turabdin. According to Assyrians from that area, Gebro Tokgöz changed his statement for fear of reprisals. During the ongoing Ergenekon case, the police arrested Mehmet Ülger, a retired army colonel, Ruhi Abat, a theology professor at Inönü University and other people who work in the military intelligence for plotting the murder of three missionaries at Zirve Publishing House in the city of Malatya. The Murder Squad was a group of students in their 20s. After an anonymous tip-off, the police arrested the ringleaders. The Police revealed in the investigation that there had been febrile contact six months before the murders via mobile phones between the murderers and the ringleaders. Phone lists show that at least 12 calls per day had taken place between all parties during the six months. The last phone calls were made the evening after the murder of three Christians, who were beheaded in their publishing house. After the killing all mobile calls between the killers and the ringleaders stopped. On November 1st, 1997, Varner Basoglu, the son of the Syriac Catholic Church Board director Can Basoglu, was found murdered. The murder came after the church had pursued a prosecution against the Turkish state, which had confiscated the church's property. On February 5th, 2006, the 60-year-old priest Andrea Santoro was shot to death at his church in the city of Trabzon. The killer was a 16-year-old boy. On July 2nd, 2006, the Catholic priest Pierre Brunissen was stabbed in the city of Samsun. On January 19th, 2007, the Armenian journalist Hrant Dink was murdered on the streets at midday in Istanbul. 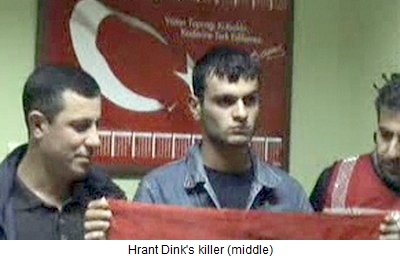 Hrant Dink's murderer was 17 years old. Hrant Dink's murderer has since been treated as a national hero by the Turkish police, where police officers posed proudly with the murderer in front of cameras. On November 28th, 2007, the monk Daniel Savci was kidnapped in Turabdin, southeastern Turkey. The perpetrators were village guards, in service of the state security forces. Recently, during the events surrounding the Mar Gabriel monastery, the monastery staff several received death threats. The threats came from a village sheriff and other people. Despite repeated open threats to the monastery staff, which have been publicized by the media, no action was been taken by the police. The threats came from people who are the subjects of the feudal lord Suleyman Celebi in the Turabdin region. Suleyman Celebi is in the Turkish Parliament as a member of the ruling AK party. In most cases, the murder weapon has been linked to the village guards, a militia which is equipped by and in the service of the government. But not a single one of these murders has led to any arrests. The victims have all been dissidents in relation to the standard Kemalist state ideology, they have been journalists, intellectuals, opposition members and Christians who sought their rights. No one was spared. From Kurdish politicians to the tiny Assyrian minority and other Christians who have never been a threat to "Kemalism", all have fallen victim to Ergenekon's terror. There are many people both inside and outside Turkey who are asking questions about where the country is heading. It is indeed very encouraging that today's government does not hesitate to reveal all those generals and soldiers who had formed a state within the state and terrorized everyone with a different political view from their own. But many who are savvy in how power structures operate in Turkey fear that what is happening now is the AKP government, together with the followers of the Fettullah-sect, who have taken positions in all governmental and military institutions, has begun to break down a competing power structure in order to establish its own position and take full control of the state. The question is whether the AKP government will deal and eliminate the terrorist network "Ergenekon" based on "Kemalism" to establish its own "Ergenekon" based on "islamofascist" ideologies.